Kenneth T. So, an award-winning Cambodian-American scientist who worked for NASA and aerospace companies for 35 years, has completed a 25-year project more challenging than rocket science: creating a monumental, 800 page history of Cambodia, from its origins to the present day. 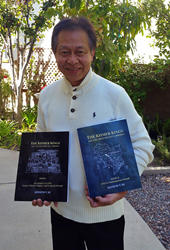 Author Kenneth T. So with "Khmer Kings and the HIstory of Cambodia" Vols 1 and 2. Despite its spectacular monuments at Angkor, which attest of a powerful empire that dominated Southeast Asia a millennium ago, whole chapters of Cambodia’s history remain a mystery. This is what led Kenneth T. So—a Cambodian-American senior rocket scientist who worked for NASA and aerospace companies for 35 years—to try filling the gaps. For a quarter of a century, he applied himself to his historical research during his every free moment, using the same dedication that had earned him the NASA Langley Research Center’s Chairman Certificate of Appreciation in the late 1980s. Since his retirement, So has worked full time to complete his monumental opus, commenting “Compiling a detailed history is not rocket science…it is much harder!” His books became available on Amazon worldwide Nov. 1. Entitled “Khmer Kings and the History of Cambodia,” his 2-volume work covers more than 2,000 years of the country’s history, including the Angkorean era that spanned six centuries, and the Cold War era of the 1960s and 1970s during which Cambodia fell under the control of a genocidal government, the Khmer Rouge. "Khmer Kings and the History of Cambodia-Book I" focuses on the shaping of the nation, covering the periods from the first century on, which became known as Funan and Chenla, up to the 1590s when Siam—as Thailand was then called—sacked the country’s capital of Longvek, an episode that profoundly marked Cambodia in every way. 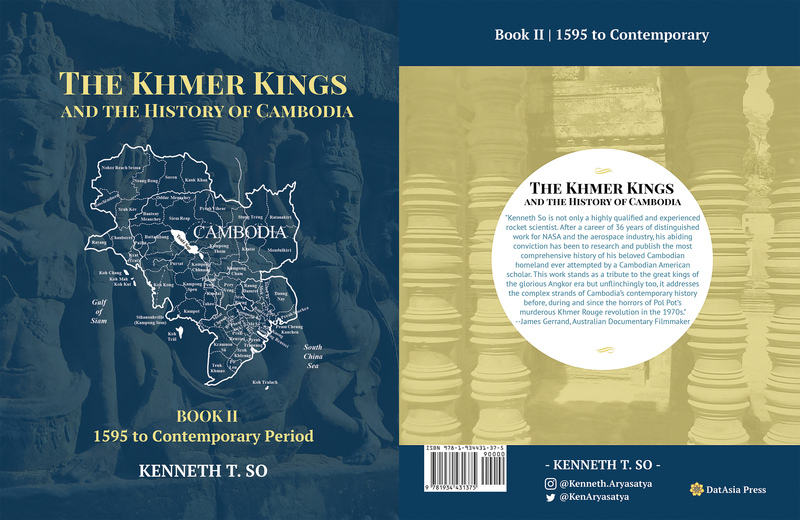 "Khmer Kings and the History of Cambodia-Book II" covers the country’s history and evolution from 1595 up to the present day. These Cambodian history books are especially significant because they were written by a Cambodian who spent his entire life with the culture, and fluent in the Khmer language. Over the past 150 years, most books on the subject have been written by Western scholars, who interpreted the kingdom’s history from their own perspectives. "Khmer Kings and the History of Cambodia" sets a new, comprehensive benchmark of understanding. Weighing close to 11 pounds (5 kilos), the two-volume set totals 804 pages, with more than 150 color photos and diagrams—including what may be the most detailed genealogical chart of Cambodia’s royal families ever published—as well as a reference section, a bibliography, appendices and a full index. "The Khmer Kings and the History of Cambodia–BOOK I–1st Century to 1595: Funan, Chenla, Angkor and Longvek Periods." ISBN–978-1-934431-36-8. $39.95. "The Khmer Kings and the History of Cambodia–BOOK II–1595 to the Contemporary Period." ISBN– 978-1-934431-37-5. $39.95. The work is published by DatAsia Press, which specializes in Southeast Asia topics—Cambodia, Laos, Thailand and Vietnam—from ancient times through the 20th century. DatAsia editions include academic-analysis works, expanded restorations of rare, obscure and out-of-print books, plus works of colonial and Belle Époque literature released in French and English translation. "The Khmer Kings and the History of Cambodia–BOOK I–1st Century to 1595: Funan, Chenla, Angkor and Longvek Periods" ISBN–978-1-934431-36-8. $39.95. "The Khmer Kings and the History of Cambodia–BOOK II–1595 to the Contemporary Period" ISBN–978-1-934431-37-5. $39.95. BOOK 1-Table of Contents and Index. 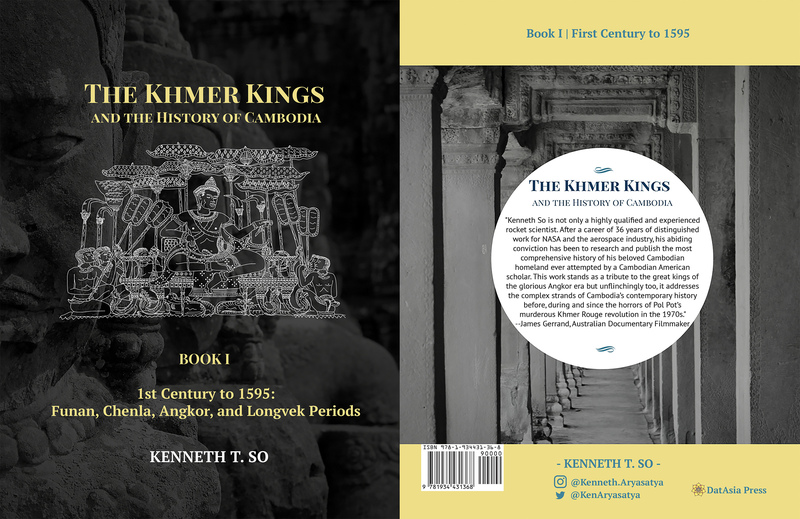 "The Khmer Kings and the History of Cambodia–1st Century to 1595: Funan, Chenla, Angkor and Longvek Periods" Book 2-TOC and Index-The "Khmer Kings and the History of Cambodia–BOOK II–1595 to the Contemporary Period" ISBN– 978-1-934431-37-5.